The steering mechanism in a car seems like a fairly simple mechanism: you turn the steering wheel, the car’s wheel turns, and the car goes in a different direction. Right? Actually, a car’s steering mechanism, while simpler than, say, the transmission, is still a fairly complex piece of machinery. Today, I’ll discuss how basic steering systems function. When you round a corner, not all of your car’s wheels turn at the same angle. Think about it. Say you are turning right. 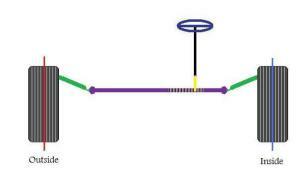 The right front wheel, or inside wheel, will need to turn around a smaller circle than the outer wheel, which means it will need to be positioned at a different angle (see figure one). The image above provides an illustration of this phenomenon. Before the car enters the turn, both front wheels are straight. As the car goes into the turn, however, the two front wheels must both be placed at an angle; the angle is much steeper for the inside wheel. Notice that if you draw lines perpendicular to the center-line of each wheel, these lines will intersect at the center of the turn. The way in which the wheels and steering wheel are linked together allows this to happen smoothly when you turn the wheel (See figure two). The steering wheel itself is attached to the track rod, which shifts from left to right when you turn the wheel. Ball bearings connect the track rod to two tie rods, which are then connected, also by ball bearings, to the steering arms. These are connected to the wheels. Taken together, these parts form a sort of parallelogram. As a result, when you turn the wheel, the inside wheel is turned at a steeper angle than the outside wheel (See figures three and four). 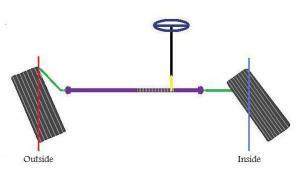 In most modern cars, the connection between steering wheel and track rod is made by a rack-and-pinion gearset, a fairly simple arrangement. A notched rod, called the rack, extends out of the track rod. The steering shaft itself ends in a round gear called a pinion. As you turn the wheel, the pinion rolls through the notches on the rack, pushing the track rod to the left or right (see figure five). This system does two things. 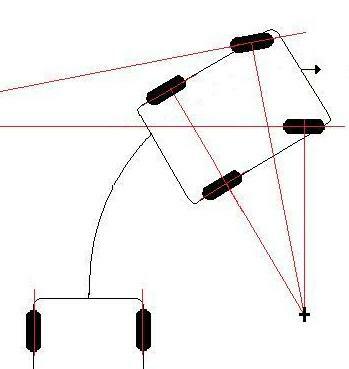 First, it turns the rotational motion of the steering wheel into the linear motion needed to turn the wheels. Second, it makes it easier for you to turn the wheels by providing a gear reduction. As in the transmission, the locking together of gears of different diameters means that you don’t have to turn the wheel as far (or as hard) in order to get a response. A car’s steering ratio indicates how many degrees you have to turn the steering wheel in order to turn the wheels by a certain amount. For example, if a car has a 20:1 steering ratio, then you need to turn the wheel 20 degrees for every 1 degree that the wheels turn. The steering ratio is determined by the spacing of the teeth on the rack and the size of the pinion gear. If a car has a low steering ratio, it means that the car will respond quickly to input from the steering wheel but will be difficult to steer. Cars with higher steering ratios are easier to steer but less responsive, i.e. you will have to turn the wheel further in order to produce a response. Most cars have steering ratios between 12:1 and 20:1. However, the steering ratio in a racing car will be closer to 1:1, so that the car is more responsive; since these cars are generally very light, difficulty in turning isn’t an issue. Some cars have something called variable ratio steering. In this system, the teeth at the center of the rack are placed close together, so that the car responds quickly when you enter a turn. However, as you get closer to the edges of the rack, the teeth are spaced further apart, so that the wheels don’t become difficult to move as you approach the limits of the turn. Rack-and-pinion is the most common design in use on the road today. However, there are a number of other steering mechanisms in use. Re-circulating ball steering is used on many heavier vehicles, such as trucks and SUVs. In this system, the rack and pinion gear is replaced by a worm gear, which is filled with re-circulating ball bearings that help to keep the teeth in this gear in contact with one another. Since this system isn’t as common, I won’t go into its workings detail. Basically, this system gives a greater mechanical advantage, i.e., like the brake system, it converts the input force into a greater output. This is why it is often used on heavier vehicles. However, since power steering is now common on most vehicles, this type of steering arrangement is no longer used as frequently. I’ll discuss power steering in my next entry.